Bling or no bling – it’s your choice. Pretentious or not – you’re in charge. People watching, food, drink, walking, window shopping, cafes, wide city streets, small quaint boutiques with flowers at the entrance, architecture, tea rooms, beauty salons, technology, fashion, an underground metro, toys, theatre, nightlife, neon, and art. All revealing a great window on to the culture. I believe that an interesting city neighborhood will have a personality. Its own character and traits. My subject, the Ginza, is a destination, thought to be one of the most luxurious shopping districts in the world. I’m telling you, that it is more than that. It is an urban experience in Tokyo, the bustling capital city of Japan. Ginza is a district of Chūō, Tokyo, located south of Yaesu and Kyōbashi, west of Tsukiji, east of Yūrakuchō and Uchisaiwaichō, and north of Shinbashi. Back in the 1600’s and 1700’s, there was a mint located in that area hence the name Ginza which in Japanese means ‘Silver Mint’. Just as a person takes on different moods with clothes, makeup, and so forth – so does the Ginza. It has different looks, feelings, and experiences. Bling or no bling – it’s your choice. Spending or observing – it’s your choice. I visited the Ginza twice during this trip and both visits were during the day. And I stayed as daylight faded into twilight when the lights came on and the shadows danced out. My first visual as I stepped out of the taxi onto the pavement was a mix of modern buildings along with European-style architecture. I had been to the Ginza years ago – and as in any city – it has undergone big changes. Still a few places remain, just as when you visit with an old friend and easily reconnect enjoying the similarities. An enjoyable familiarity. My Tokyo home base became the Royal Park Hotel, The Shiodome. The Shiodome area is not far from Shinbashi Station and close to Ginza about ten minutes by car. It’s possible to walk. But it gets difficult to know which streets connect. I tried it and needed a local to assist with directions who also was equally challenged even with a GPS. Take a taxi or the underground. 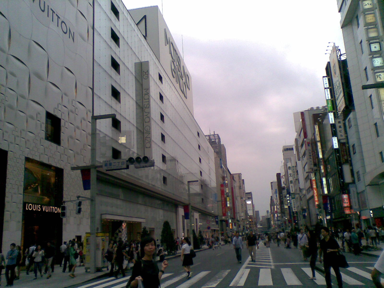 The Ginza is one huge shopping promenade. Don’t expect much English to be used. If you find more English speaking – that is to your advantage. Take a stroll along the main shopping street Chuo-dori when it is closed to automobiles during the weekend afternoons from 12-5pm. It is a pedestrian paradise – open and inviting. The street is really wide giving it a grand open air feeling. 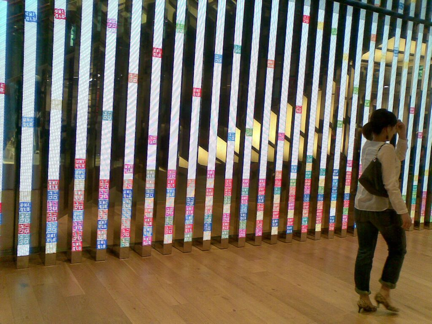 It is well known that the Ginza is the best place to window shop in Japan, due to the dramatic and unusual displays. See what happens on the day or evening that you visit. I had traveled from the Middle East, Riyadh to Tokyo thru Seoul for this trip. That’s about 16 hours of flying time to include layover plus a time change of the new location being six hours ahead. I highly recommend to pre-plan your first morning and day in any new city. Not in an OCD way, but smart planning creates great results. Consider your time changes, dietary, sleep and how long you will be in the same area. My total trip to Japan was only about 8 days including flying time which now cuts off a few days. Do maximize each day. And I don’t mean by running from place to place. That is ridiculous. I never do this. I pencil in places to go and necessary appointments. And leave hours and evenings that are free and open. Schedules change. Weather can be a factor. Transport also. Of course, it depends on whether your travels are business or personal. This particular trip of mine was a mix. Before arriving in Tokyo, I had my hotel pre-book a shampoo, blow-dry hairstyle at a salon in Ginza. This was my first day in a new land and I used my theory of pampering and maintenance as one way to blow off the jet lag. And think of this as a double-header as well. Since I now will have nice coiffed hair to continue my travels. 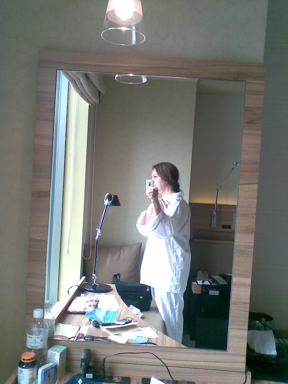 I woke up, after a decent night’s sleep – then on to my first day in Tokyo. I had a taxi drop me at the hair salon. The duration for the service was a bit longer than usual. I do believe they were being careful because the hotel had called ahead to give my explicit directions. I have nothing to complain about as the customer service and hair styling were excellent. A treatment like this is so refreshing after a long flight. And it’s a great way to begin an affair. I walked out of the trendy salon and across the street was the Wako building. So I stopped in at the Wako Annex and looked at their Tea Salon with gourmet foods and chocolates. Window food shopping. Plenty ahead. Start your engines. Simply stated – it’s a shopping quarter – instead of a big mall. Big brands and smaller shops all coexist in one district. Flagship stores and brands such as Chanel, Furla, Coach, Shiseido, Hermes, Louis Vuitton, Gucci, Mikimoto, the Apple store, and the Sony showroom. I passed by Uniqlo. It’s a massive brand in Japan. Their headquarters are in Akasaka, if you get to that area. 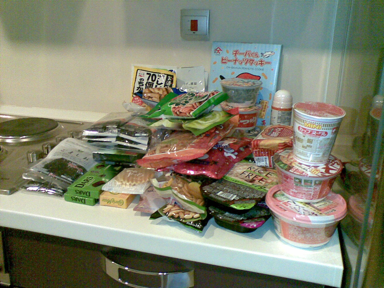 I’d been to the stores in Kuala Lumpur and San Francisco and had no idea of their Ginza location. A spontaneous impulse drew me in for a simple look around. So, I popped in to find that this store is gigantic with eleven floors of their affordable basics for both men and women. Tea in the traditional form is a whole other topic for another time. Another global drink of favor is coffee – certainly one of the food groups. There are plenty of coffeehouses including one of my favorites. There is was, on an important street corner. On other trips to Japan I got attached to the Doutor Coffee. It is one magnet and always a good repeat. 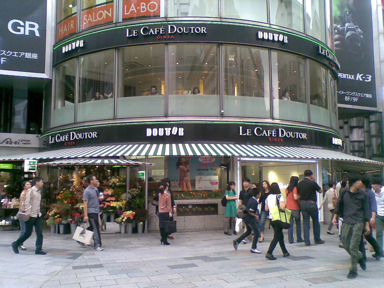 Doutor Coffee opened the first European styled café in Harajuku, Japan in 1980. Now there are over 900 locations in Japan with expansion into Taiwan and Korea. It’s one of my preferences. Invite me and I’ll fly over. I looked ahead, crossed the huge intersection, and there I was standing at the corner of a true classic department store dating back to 1673, Mitsukoshi. I had been there ten years ago and vaguely remembered the experience. What a déjà vu at that moment. A friend you had not seen in years. As I wandered around this department store my eyes guided me to certain sections in the store – incense, clothing, accessories, housewares, and art pieces. I followed my eyes, nose, and mood. Hands down – the winner is the food. Two basement level floors are filled with an insane variety of foods. I could almost hear Angels singing, cooking, and baking. Everything is clean, displayed well, beautifully crafted. Ohhh the packaging and eye appeal. I searched the aisles and counters for favorites, and for items that are packable. How much can I really fit into my suitcase, any suitcase? Sushi, bento boxes, desserts, French pastries, chocolates, wagashi, wines, sake, seafood, soba, nori, meats, fruits – it’s spectacular. You can grab something to easily take back to your hotel. That is, if you can wait. I could not – and would not wait. Are you kidding? As I found out: customers can only eat up on the 9th floor where there is a designated area. I took a small snack up to the eating zone because it was the next best thing to wolfing something on an escalator. Which would not go over at all in Tokyo and is not my style. As you walk down the aisles of Food Heaven, I encourage you to visit the Johan Paris food counter. I thought I had discovered Johan Paris as ‘my’ special favorite. Pretty silly of me, since they opened in 1983. Folks adore their lovely baked goodies. Johan Paris continues to be a personal worldwide favorite of mine. I had a napkin with the logo on my desk for months and just stared at it. Stop by for the best little sandwiches I ever had. They melt in your mouth. There was something about the taste of their simple sandwiches. So satisfying. People are mad for their chocolate bread – they actually line up and take tickets ahead of time for the ‘bread reveal’ – like a lottery. Maybe you are lucky and maybe you are not. I held off to endeavor this until my next visit. If you are following my plan and are still in Mitsukoshi, I encourage you to sit down and have a relaxing meal. Located within the store is a French and an English cafe that are both quite popular: Ladurée Salon de The and Harrods The Plantation Rooms. There are also restaurants in Mitsukoshi on the 11th floor. This is where I stopped for my lunch at Choutoku. It may be average to locals. To me it was a respectable udon lunch in the style I had not had since my days in J-town, San Francisco. Back outside now and I let my feet and intuition lead the way. Lucky for me, I stumbled upon the perfect place for an afternoon glass of champagne – GOSS. Another one of those coincidences. Or are they…? It’s a champagne wine bar on a side street just off of the heart of the Ginza. Chic & relaxed, comfortable, and with good service. A great selection of wines. My thirst was for champagne and I sat at the bar and enjoyed. I didn’t want to stay there too long and knew I could always return. 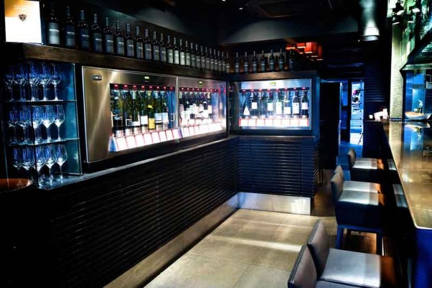 And I will because GOSS has sister restaurants and bars in Ginza. Once again – I am enamored. 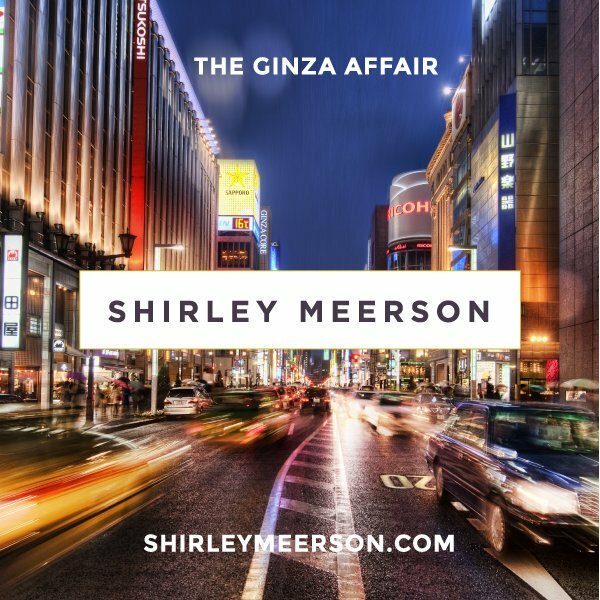 That is The Ginza Affair. My escapade. I encourage you in yours. Ginza is a different story in the evening with the lights, entertainment, bars, lounges, and nightclubs. I’d go back to catch the night lights of that neighborhood – neon and colorful like an art piece in itself. As in any relationship or affair of any kind – I encourage you to view the many personalities and other facets. Day or night, rain or shine, with or without make-up. Encounter all of the moods in the Ginza. Join the Ageless Wellness Inner Circle!